In order to best advise you on how to capture your personal style and the vision for your piece, we will invite you to be part of as much of the Antique 2 Chic process as you wish. Using our extensive contact network throughout the UK we can source a wide variety of antique and vintage upholstery furniture, including armchairs, sofas, dining chairs, stools, chaise-longue and beds, which have graced many periods settings throughout history from Georgian through to Art Deco and the 1950's. Directed by you, we will source the period, style and type of antique you desire. However we are happy to work on an antique already owned by you or one from your own source. Once you have chosen your perfect antique, we will explain to you in detail the level of repair and restoration required and the materials involved in reviving its physical character and heritage, before it can be reupholstered. Using our knowledge and craftsmanship your piece of furniture will be professionally restored using traditional methods and materials. All the work will be carried out in our own workshop and to the highest possible standard. Whether you have a particular design or theme in mind, or need inspiration, we will work with you to understand the essence of your personal style. 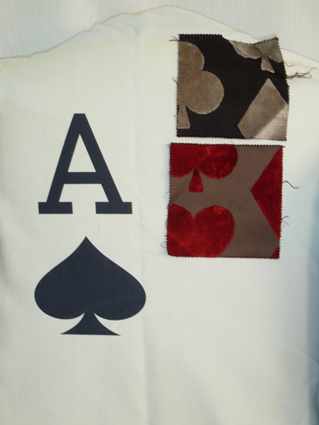 We will then source fabric samples and suggest bespoke designs that work well together, before turning your piece into reality. 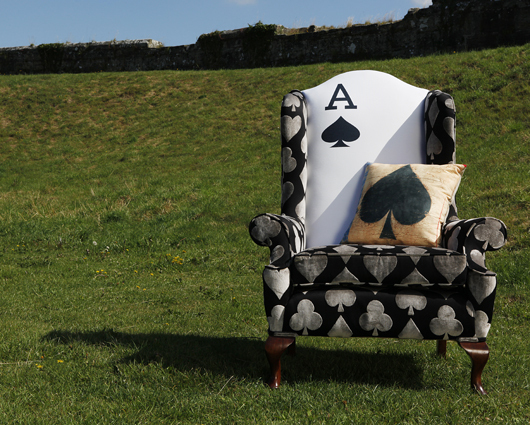 Your piece can be created with completely custom-made upholstery which enables you to print any design, image or logo made to order on your chosen fabric. Due to the bespoke nature of the Antique 2 Chic process, the timeframe and cost associated with each piece will vary greatly and will be discussed with you from the outset. From which ever historical setting, the originality of each antique together with the quality of its repair and restoration will enhance its value, and over time, whether for your own pleasure, or eventual monetary return, your individual piece of Antique 2 Chic will give you the potential to grow a very successful long term investment. 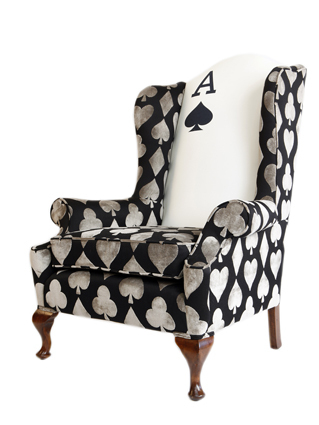 If you don't choose to commission your own piece, we are continually inspiring new luxury antique designs for our customers to rent or buy, our designer sofas and chairs are bespoke pieces of antique furniture which have been exclusively commissioned by Antique 2 Chic. Whether you're redecorating your home, updating a hotel room or business reception, organising a themed party, planning an advertising shoot, designing a seasonal window display or theatrical film set, please contact us to find out more about the pieces we sell and rent, timescales, costs, and terms and conditions. 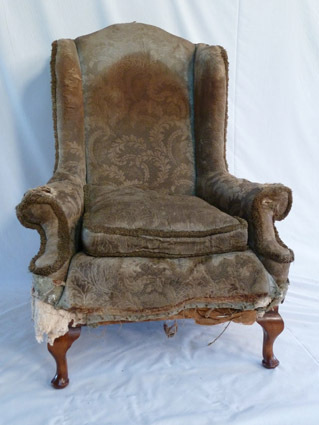 This late Edwardian wing chair was one of a pair found on top of a wood pile in an outside shed. These pictures show the process from finding the chair, through the restoration and fabric selection stage and finally the finished piece.